Space velocities in spherical coordinates (r, θ, ϕ) are shown for our sample of 7664 halo K giants (black dots and small red crosses) for which we have LAMOST line-of-sight velocities and metallicities, and Gaia proper motions. 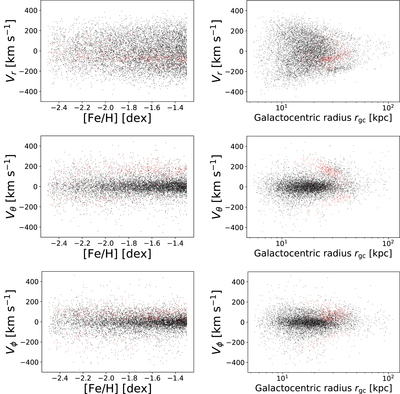 In the left panels, the velocities are shown vs. metallicity [Fe/H], and in the right panels vs. Galactocentric distance rgc. We use the energy vs. total angular momentum E–L plane to flag an overdense region of stars as those predominantly belonging to Sagittarius (see Section 3.2 and Figure 6). 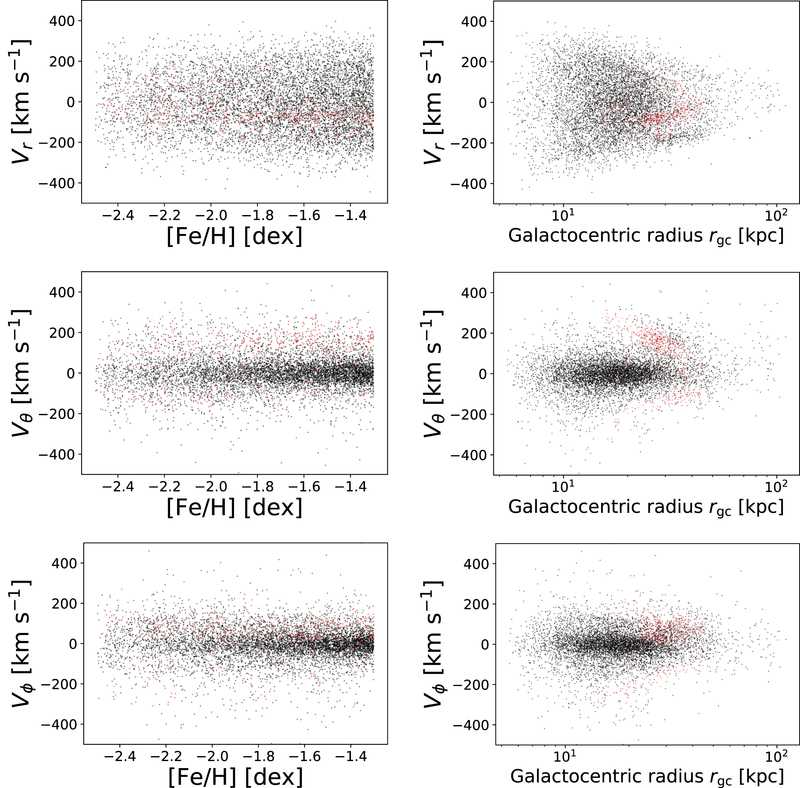 We propagate our E–L selected Sagittarius-member stars in red in the left and right panels to view their characteristics in Galactocentric distance, velocity, and metallicity. In the right panels in particular, several substructures in the kinematics are clear, including that due to the Sagittarius stream discussed in Section 3.2. The Galactocentric radial velocities Vr show a considerably broader distribution than either of the tangential velocity components Vθ and Vϕ: the orbital families are predominantly radial. This becomes distinctly less the case for the lowest metallicities probed (left panels, [Fe/H] < −2), as discussed in Section 3.4, although the orbits are still predominantly radial.